Since feudal times in Japan, Masu was a wooden box used to measure rice, enough to find one person for the day. 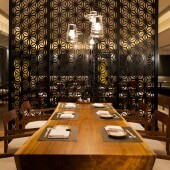 The owner of the restaurant wish to evolve this concept to provide their customer with true taste of Japan for one meal. Shedding all unnecessary flourished, Masu's chef Kazuya Nemoto emphasised on using only the freshest local and regional ingredients, with traditional japanese cooking techniques including Kobatayaki, sushi and other specialities. stone, harvest wood, veneer, marble, stainless steel. J. Candice Interior Architects, 2013. Since feudal times in Japan, Masu was a wooden box used to measure rice, enough to find one person for the day. 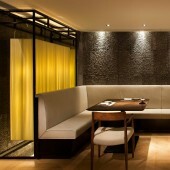 The owner of the restaurant wish to evolve this concept to provide their customer with true taste of Japan for one meal. 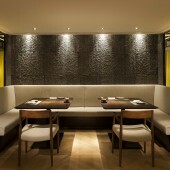 Masu Japanese Restaurant by J. Candice Interior Architects is a Nominee in Interior Space and Exhibition Design Category. 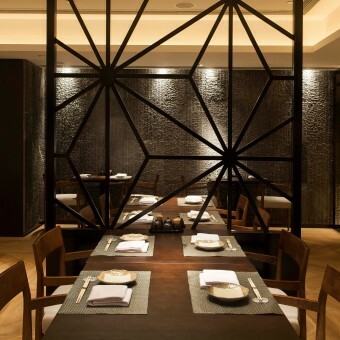 Masu Japanese Restaurant by J. Candice Interior Architects is Winner in Interior Space and Exhibition Design Category, 2013 - 2014. 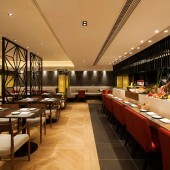 Did you like Masu Japanese Restaurant? Help us create a global awareness for good interior design worldwide. Show your support for J. Candice Interior Architects, the creator of great interior design by gifting them a nomination ticket so that we could promote more of their great interior designs.